Favorite toy: tennis ball/chuck it - he can play for hours and won't stop, he is totally fixated with it. More about Lemon Drop: "I am not sure what lemon drop's story was before I adopted him other than the fact that he was surrendered to the government kennels which terminate animals after 4 days. Luckily Hong Kong Dog Rescue took him in and I adopted him July 2008. He is such a friendly dog and I couldn't imagine life without him now. 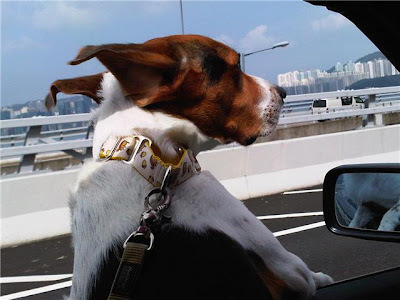 These days he is most happy when he is either playing chuck it, riding in the car with the wind in his face or eating." 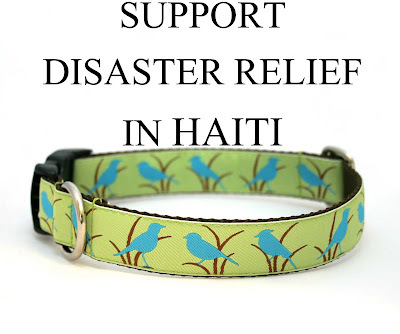 100% of the proceeds of the sale of each of these collars will go to Haiti disaster relief to the American Red Cross. I want to sell as many as possible to help this cause. 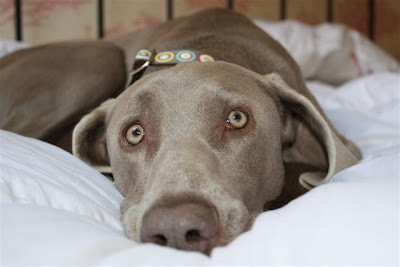 If you don't want to buy the collar for your own dog, please consider giving it as a gift. twit⋅ter: to utter a succession of small, tremulous sounds, as a bird. This cheerful 1" traditional buckle collar features blue birds tweeting on a light lime green background. It is backed with a heavy nylon webbing and a strong plastic side release buckle and a D-ring for attaching tags. 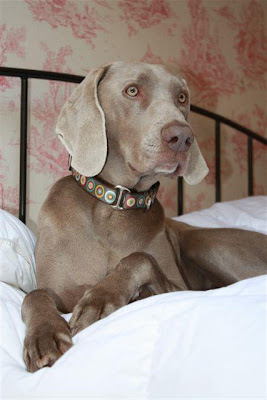 All collars are fully adjustable and triple stitched at stress points to prevent breaking and prolong durability. 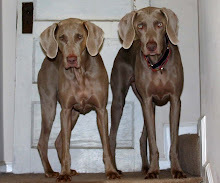 1 year warranty on repairs unrelated to pet or owner misuse and on all metal hardware.